This challah cover is part of the Rikmat Elimelech designer collection. Designed with silver and white colored thread, the double framed outline embroidery with fancy twirls and flowers on shiny terelyne material make this challah cover a classy choice. The challah cover has a quilted affect look. 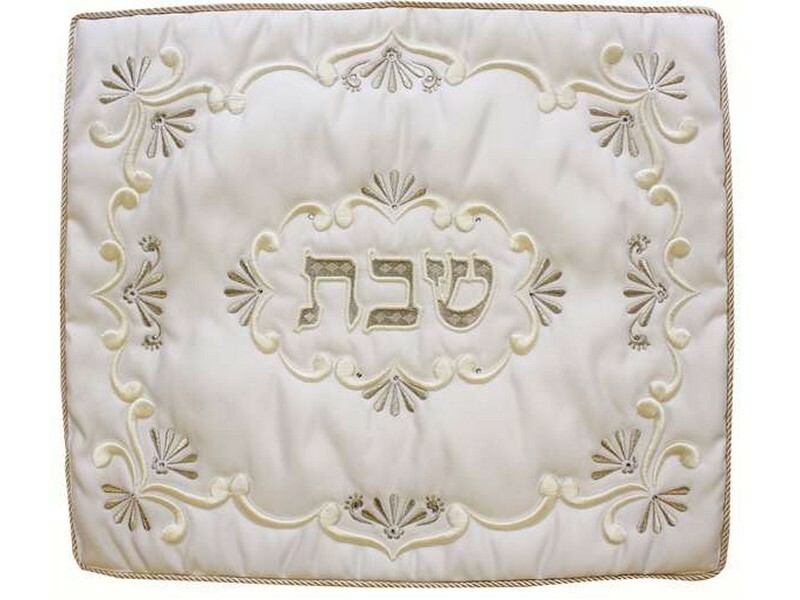 The Hebrew word “Shabbat” is embroidered elegantly in the center of the challah cover. The edges are trimmed with a gold twisted rope. Rikmat Elimelech is an Israeli manufacturer situated in the rural and green moshav of Kfar Pines, located in Northern Israel near Haifa. Founded by embroidery artist Elimelech Shweitze, who was awarded with recognition as the first embroidery artist in Tel Aviv in 1949, Rikmat Elimelech specializes in creating Jewish religious articles with both traditional and modern colors and designs. Rikmat Elimelech has earned its reputation for their superb craftsmanship and attention to detail.